Smith Brothers are known for producing some of the best cough remedies in the world! Sleek design and undeniable sophistication make up these Smith Brothers cough drops. And think about – when you’re coughing up a storm and need some soothing relief, a little elegance is exactly what you need! With Smith Brother’s throat drops you’ll be on your way to a soothing relief in no time. 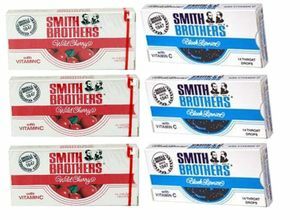 Whether you prefer the classic flavor of Smith Brother licorice cough drops or the fruitier cherry alternative, you’re in the right place. Smith Brothers has the unique ability to sooth even the hoarsest of throats, sure to get you feeling perky and alive in no time!